HGM6510 generator parallel applicable controller with capacity of up to 10 sets of generating capacity or manual or automatic parallel system, which can realize the automatic generating start /shutdown, data measurement, police protection function. Controller using large LCD display (LCD), can choose Chinese and English interface, easy operation, reliable operation. Controller has control of function, GOV and AVR sync can divide and load, and equipped with HGM6510 controller for parallel generator. 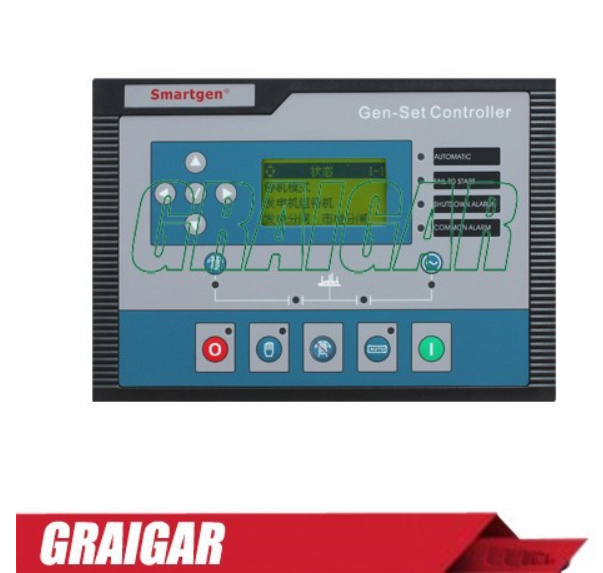 HGM6510 controller accurate monitoring of the various work generators, when generating abnormal work automatically closed generators, and will be displayed in the LCD fault condition. HGM6510 controller based on 32bit MPU design, with SAE J1939 interface, and has many J1939 interface EFI engine ECU (ENGINE CONTROL UNIT), engine speed, temperature, the oil temperature, oil pressure etc. Parameters through J1939 interface as reads and directly on the LCD display, in the controller, the other users no longer reduces complex loading sensor, and the connection of precision mechanical parameters are launched. On 32bit MPU as the core, the big screen LCD backlit, can be selected with English and Chinese, light touch button operation. In automatic mode has a variety of conditions: without load operation, parallel operation, intelligent parallel operation. A solution in the transfer functions of load. Has the timing belt/ without load trial function, can realize weekly/monthly cycle start /shutdown. Has the SAE J1939 interface, which can be directly EFI engine control through the interface. Measure true effective value, suitable for various powers in occasions. Accurate measurement and display function: to diesel generating sets electric parameters and water temperature, oil pressure, oil level, real-time monitoring etc. The control and protection function: realizing diesel generating sets, automatic startup/stop in parallel, load and synchronous another alarm functions. With unit maintenance/maintenance time to warn/stop function. Built-in GSM/SMS communication functions (via RS485/RS232 interface). Parameter setting function: allows the user to change its parameters, in internal memory settings, in system memory to FLASH when the power is not lost. In does not have the engine can also J1939 external temperature, pressure and oil level etc. Multiple sensors can directly use, also can choose custom sensor curve. Programmable input mouth effective when the content is displayed on LCD and set free, support Chinese and English, can define 20 English characters or 10 Chinese characters. Programmable for low-level input mouth effective or high level, programmable export to often open output or closed output. With programmable logic export custom output can be sustained, export output for pulse output. With real-time calendar, clock and operation time functions. To preserve historical records, and 99 group of records in site. Multilevel password protection, avoid laypeople wrong operation. The generator operating parameters through the front panel programming or through the PC modification. Wide range of power supply (8-35) VDC, can adapt different starting battery voltage environment. RS485/232C communication interface using MODBUS communication protocols, can realize the "four" control generating function. Modular structure design, pluggable type terminals, embedded installation, compact structure, convenient installation.